Aritar is a part of east Sikkim known for its natural beauty and rich history. This is an ideal destination for those who are looking to enjoy nature. With a picturesque portrayal of serene lakes, lush forests and hills with thick paddy fields, you are going to feel like you are in heaven. The early morning view of this place is just inexplicably stunning. Aritar is a place worth visiting if you love nature and adventure. Whether you wish to take a trek up the hills or take a paddle boat ride, this is the place for you. You can also spend your time marvelling at the beauty of jungle orchids, tall trees and huge mountains as you travel. Some of the attractions in Aritar are the Lampokhari Lake, the Aritar Gumpa, Mankhim and Love Dara. Aritar Gumpa is one of the oldest monasteries and an attraction in Aritar. The monastery is known for its beautiful architecture and collection of artifacts, murals and other paintings. It also contains various ancient manuscripts. The Lampokhari Lake is located near Rhenock and takes a three hours' drive from Gangtok. 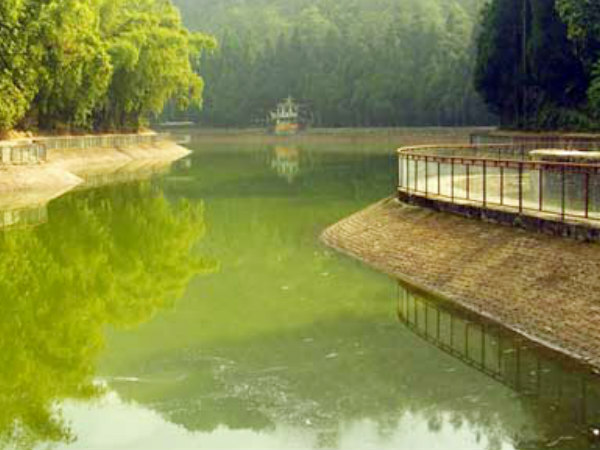 The Lampokhari Lake is one of the oldest natural lakes in Sikkim. It is located at an altitude of 4,600 ft above sea level. The lake was recently renovated to provide boating facilities for tourists. The Lampokhari Lake is also called as the Aritar Lake among the natives of Sikkim. This is in fact the only lake that provides paddle boating facilities in Sikkim. You can also pay a visit to the nearby Lingsay Monastery and the Mankhim Temple. The Parbateyswar Shivalaya Mandir is a famous pilgrimage site and a place to visit in Aritar. The principle deity of the temple is Lord Shiva. The monsoon season is the time when devotees flock to the temple with offerings to Lord Shiva. The Changey Waterfalls are located near the famous Lampokhari Lake. The waterfalls offer beautiful views of its surroundings and is at a height of 50 mt. The Lungchok valley is located near Lokdara, Chujachen. The valley is a known trekking site and also famous for the breathtaking views of its surroundings. The Kali Khola Falls or the Loney Falls is located at the Rorathang-Rongli road and is about 100 mt high. It is one of the major attractions in Aritar. Tourists come here to see the breathtaking scene of the waters gushing down. The Mankhim Temple is located at the Maity Village in Aritar. The temple is of Rai origin, who believe in the worship of nature. The Rai community assembles at the temple twice a year for celebrating 'Sakew'. The 'Sakewa puja' is done when the seeds sown by the tribes in the fields grow and bloom. The celebration includes dancing and singing. This usually happens in August or September. The Phushrey Lake is situated just a few kilometres from Aritar and is best known for its wild orchids and various species of butterflies and other animals like Red Panda and Peasant. By Air: The airport Of Siliguri is the nearest airport to Aritar. The airport is well connected to major Indian cities like Mumbai, New Delhi, Chennai and Kolkata. International flights also operate to this airport from destinations like Bangkok and Paro. By Train: The nearest railhead to Aritar is located at Siliguri. The Siliguri Railway Station is connected to many major cities in the country which include Chennai, Trivandrum, Secunderabad, Cochin and Guwahati. By Road: The most convenient way to reach Aritar from the other cities of Sikkim is to take a taxi to the place. It is just a three hours' drive from the city of Gangtok.